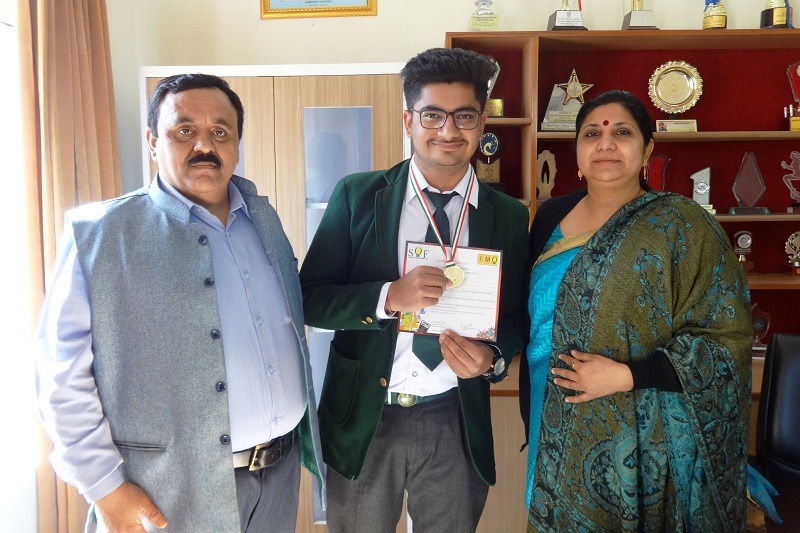 Devansh Bhalla (X-B) of Delhi Public School, Jammu was awarded a Gold Medal and a Certificate of Excellence for his distinctive performance in International Mathematics Olympiad organized by Science Olympiad Foundation (SOF) held on 4th December, 2018. Out of scores of students who participated in the said Olympiad, Devansh scored zonal rank 21 and International Rank 651. He also qualified for the second level of the examination. Earlier, he also qualified the NTSE 1st Level Exam with rank 16 at the State Level and reached the 3rd Level in Indian National Mathematics Olympiad conducted by Homi Bhabha Centre for Science and Education. Principal, DPS Jammu, Ms. Ruchi Chabra congratulated Devansh and his proud parents for the achievement. She said that students should try to enhance their abilities through exposure in National & International arena for the better growth. Hon’ble President, RCT, Sh. M.K Ajatshatru Singh Ji, Hon’ble PVC, Kunwrani Ritu Singh Ji and Hon’ble Director, Sh. S.S Sodhi Ji extended their best wishes to Devansh and his parents.